With the expansion of technology, you have an extraordinary opportunity to further your sermon content beyond Sunday morning. The thought process used to be (and still in some places is) preach one message on Sunday morning, a different on Sunday night, and yet another one on Wednesday night. The people who came to all 3 were the super spiritual people of your congregation. But times have changed and thought processes have changed. 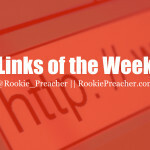 Is it good to end up preaching 3 different sermons every week or is it better to hone in on one message and have everything throughout the week point people back to that one thing? As Andy Stanley expresses in his book, Communicating for a Change, if you have a 3 point sermon, make it into a 3 part series. This will force you to focus everything in your message on one big idea. Instead of letting your sermon content be forgotten as the week goes on (people do forget your message, by the way), you can do these 5 of things to further your sermon content throughout the week. Instead of always having your small group content be unrelated to the message – like the old Wednesday night Bible studies – you can have them focus in on the sermon from Sunday. Some churches do this all the time and some do this for major sermon series. There is an art to doing this because you don’t want it to simply be a rehashing of the sermon. You want the questions to focus in on the application of the material that was presented on Sunday. Imagine if your congregation was confronted with the call to action of your message in a more intimate environment where they had people who would hold them accountable. That is the benefit of utilizing sermon based small groups. As you were preparing your message, there were probably things you came across in your study that you didn’t include in your sermon. What if you could use that material to further your message throughout the week? I believe you can. If you have a blog (which you totally should) or your church’s website has blog capabilities, you can put your unused material to work. If you shared two stories in your original message, but had a couple more that you decided not to use, you could craft your blog post around one of those unused stories. It’s important – just like with the sermon based small groups – that you don’t just rehash your sermon content. Come up with a new way to get to your bottom line. Use a different story to illustrate the need for everyone applying that truth to their lives. 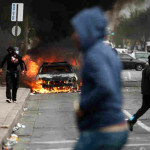 Take a look at this as an example. If you don’t feel comfortable writing out an article, do a video blog – a short video where you share the same content as you would a blog post. If you decide to do this in written form, be sure to have someone else look over your article and make grammatical edits where needed. One thing is for sure: writing a sermon and writing an article are two very different things. In one you’re not at all concerned about grammar because it is written to be spoken. In the other you’re surely concerned about grammar because it is written to be read. If you are utilizing a one-point sermon, your bottom line should be something that can be utilized as a tweet on Twitter. Various quotes from your message can be turned into picture quotes that can be utilized on channels like Instagram, Twitter, and Facebook. Video clips from your sermon can be specially edited for social media use. Don’t be afraid to utilize hashtags for your sermon or sermon series. Encourage your congregation to engage with you on social media and to utilize those designated hashtags. The possibilities are great. You can do this if you give practical next steps so that people can take action. After all, the goal is life-change and by doing this, your sermon content is going even deeper than an intellectual awareness. It’s going to an action! While this isn’t for everyone and it wouldn’t be something that could be done for each sermon or sermon series, this is a no-brainer as far as extending your content not only through the week, but for much longer. If you have a particular sermon series that you are extremely passionate about, utilize each week of the series as a chapter in a book where you expand on the topic even more than what is discussed in your sermons. If you end up seriously considering writing a book, you have to check out this episode of the Carey Nieuwhof Leadership Podcast where he interviews Pastor and Author, Mark Batterson on how he writes books and leads a growing church. A lot of time is spent on preparing, writing, and delivering your sermon. If you’re not intentional about furthering that content past Sunday, you’re doing a disservice to the people who God has entrusted you to serve. God’s grace shown through your sermon is important enough that it should be reminding people of its truth all throughout the week. 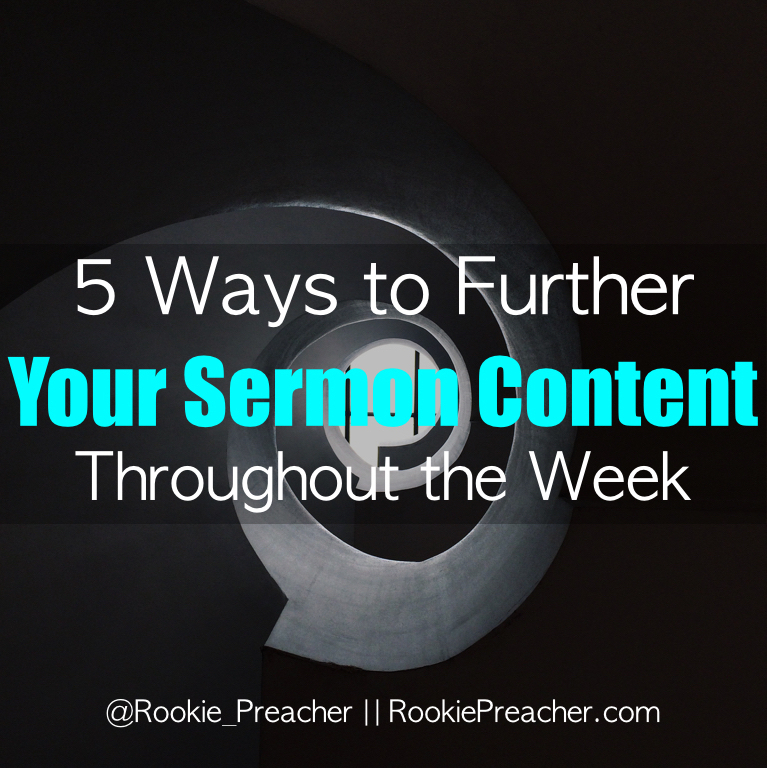 Don’t miss out on furthering your sermon content throughout the week.